"May I be of assistance? After all, you ARE a damsel in distress, aren't you?" More boxed-set goodness heads our way with the third set of A&E's The Saint, kicking in during the 1966 season when the show was first broadcast in color. 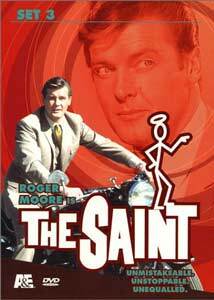 For those who came in late, The Saint is the seemingly never-ending adventures of one Simon Templar (Roger Moore), a mystery man with all the right contacts; none of which ever seem to be able to keep him out of trouble. We begin with:Flight PlanIn a plot reminiscent of Thunderball, a group of arms dealers concoct a complex plan to hijack a special new Air Force plane. Templar, never far from the action, finds himself coincidentally involved with the sister of the pilot scheduled to fly that particular plane. The plot thickens when she disappears and the arms dealers target Templar next. A decent episode overall, but has a few logic problems early on that are rare for Saint episodes.Rating: 3 out of 5 halosEscape RouteThe unthinkable happens: Simon Templar is caught and captured by Inspector Teal! He's put on trial and sent to prison for his numerous, cunning crimes; an event truly worthy of massive proportions. Of course, knowing Simon Templar, there's an angle involved, and not long after he's in the "big house," things start to fall into place. A noteworthy episode for the fact that it was directed by Moore himself, but also featured an early (and impressive) performance by Donald Sutherland as one of Moore's cellmates. Definitely a healthy change for the series as Templar is not the one with all the power; instead, it's a more cerebral adventure with Templar dealing his way into an escape plan being designed behind-the-scenes.Rating: 4 out of 5 halos.The Persistent PatriotsWhen Templar foils an assassination attempt against Jack Liskard, the Prime Minister of an obscure British colony in Africa, he once again has a person of high-standing indebted to him. The PM wants freedom for the people of this colony, but apparently, someone wants him silenced, permanently. Templar wants to look out for Liskard, and must balance the need for publicity with the need for safety very carefully. The espionage angle is a refreshing change from Simon chasing women and getting involved with other people's wives or girlfriends.Rating: 3 out of 5 halos.The Fast WomenLeave it to Simon Templar to locate a group of women race-car drivers who take theirsport dead seriously. So much so, in fact, that the number one racer faces sabotage and death threats from what could be a fellow driver. Templar steps in to investigate and, of course, winds up in all sorts of trouble. The racing world makes a nice fish-out-of-water setting, but seems a bit forced for Templar, who is just too sophisticated a character to slip seamlessly into this realm. Typically, high stakes robberies and saving the country are more his flavor, rather than settling scores in a sporting environment, but the episode still handles it well.Rating: 3 out of 5 halos.The Death GameIn another unusual plot, Simon is faced with a man who wants to create the perfect assassins by manipulating people psychologically. To test out the mettle of his creations, Templar is the target of his newest operation. With this story's rare, dark edge, this episode is a definite change of pace and makes a good, serious exploration of his abilities under pressure.Rating: 4 out of 5 halos.The Art CollectorsWhile in Paris, Templar does his best to flirt with a wealthy socialite, but she resists his advances. That is, until she needs his help to protect her from kidnappers intent on getting their hands on three extremely rare paintings. Templar tries to protect her by sending himself to the crooks instead of the paintings. Fast-paced, and typically good-humored, this is a solid entry in the series.Rating: 5 out of 5 halos.To Kill a SaintBack in Paris again, Templar finds himself the target of numerous assassination attempts. It becomes obvious that Paul Verrier, the leader of a powerful, secretive mob, is the one trying to lead Templar to his doom. A personal grudge between the two has turned deadly and now it has to be settled.Rating: 4 out of 5 halos.One of the things immediately noticeable about this box set is the presence of seven episodes as opposed to the usual six. In all of these episodes, the subject matter is heavily focused on Templar's schemes involving the women he gets attached to. There's little to complain about; if you enjoy The Saint, this collection of episodes is basically the type you expect to see. Although none of these plots are directly based on stories by Leslie Charteris, they keep thegeneral spirit of the classic Charteris episodes. At times, it's obvious the show was trying to compete with the spy-crazy atmosphere of the late 1960s and, ironically, Roger Moore was often placed in James Bondian situations. The production keeps a level head, though, and never goes way outside of Templar's usual domain, so it's effective. Image Transfer Review: Although a few episodes show slightly faded color and heavy grain, the overall quality is very impressive and clean, managing to breathe new life into such an old show. The only significant problem is that the image tends to move around in the frame a lot, something common to some of these programs. It's not bad, though, and only seems to be a problem in the earlier portions of the episodes. There are no major instances of compression artifacts, although some background shimmer is apparent in darker sequences. Audio Transfer Review: Perfectly audible and understandable, the Pro-Logic mono soundtrack gets the job donepainlessly and offers reasonable resolution and clarity. There are no problems here, andthe choice of decoding as a center channel mix or left/right mix seems to be totally up tothe viewer. Extras Review: The supplements are nothing grand, but contain basic information. There's text files ofRoger Moore's biography and a brief history of The Saint as a literary character. The photo gallery contains stills from the episodes as well as behind-the-scenes picsof the cast and crew at work. The broadcast teasers for each episode are also presented. The Saint is still a worthy buy for the fan and, if you can find them, a good rentalas well. I'd like to see the earlier seasons come home as well, but for now, Simon Templaris on the job and unstoppable.